To address the ever-increasing need for low volume genomics, Micronic launches the 0.30ml tube with external thread that enables miniaturization of reaction volume required in genomic applications. The tube cuts out intermediate (screening) plates and is more accessible for low volume liquid handlers. In addition, the automation friendly 0.30ml tube with a working volume of 210µl, is ideal for RNA/DNA libraries, unique aliquoting and storage capacity with multi access. After the 0.75ml and 1.40ml tubes, the 0.30ml tube is the next size in a range of new designs featuring an external thread. Using externally threaded tubes for sample storage eliminates the possibility of the sample coming into contact with the screw thread, greatly reducing the chance of cross-contamination while improving sample integrity. Due to thick tube walls, the tube has a sturdy design and excellent properties for ultra-low temperature storage. 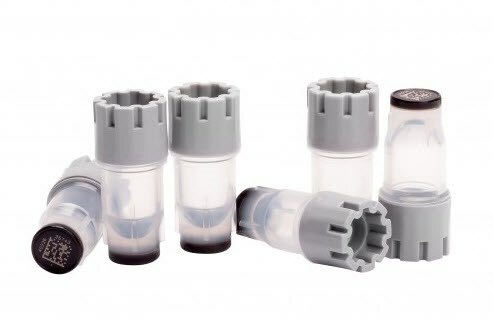 The triple thread of the tubes gives an excellent closure and horizontal placement of the cap to ensure long-term sample preservation and storage. The screw cap also has a triple start thread for optimal sealing quality and is available in 6 different colors. The code surface of the tubes with external thread features a raised edge, which protects the 2D code against accidental scratches. Due to the unique injection molding technique used to manufacture the sample storage tubes, the black code surface with 2D Data-Matrix code cannot be separated from the transparent tube. The 2D codes also have a human-readable code for additional identification. The codes are permanently laser-etched into the tube bottom so that they can never wear or fall off. Headquartered in The Netherlands, Micronic’s products are produced in a certified class-7 clean room environment at facilities in both the Netherlands and the United States. All of their labware equipment is also assembled in-house. The sample tubes are made using medical-approved polypropylene (CE-IVD) and are RNase/DNase and pyrogen free. The 0.30ml tubes are available for purchase in bulk and in a Micronic ULT Rack, and are compatible with Micronic Screw Cap Recappers and other automated systems.